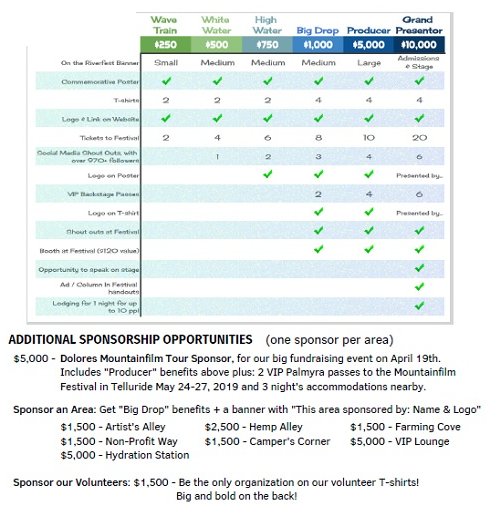 We are on the search for a variety of sponsors to help us put on the Dolores River Festival. This will help allay costs for stage & equipment rental, band fees, supplies, security and space rental and put more money towards the causes that the Greater Dolores Action does, like river cleanup, river guage stations, and educational signs along the Dolores River. All donations are tax-deductible. This is your chance for your organization to reach 2000+ people that flock from all over the Four Corners region and beyond. This year we are celebrating our local agricultural heritage and are featuring farming, hemp and water conservancy booths and educational areas. The kids activity area, free raft rides, and parade float through town always draws a crowd, along with the amazing music lineup and plenty of booths and food vendors to visit. Wave Train $250 White Water $500 High Water $750 Big Drop $1,000 Producer $5,000 Grand Presenter $10,000 We are interested in sponsoring an area, please contact us with which areas are still available. We look forward to seeing you at this great community event to celebrate the Dolores River and the many ways in which it connects us to each other, the environment, and our resources. Thank you for your continued support! Or go on our website and pay your sponsorship online here. Thank you for wanting to sponsor our event! We will promote it everywhere we can!